The near-field measure is used to overcome the effects of low frequency standing waves caused by diffractions and room reflections. 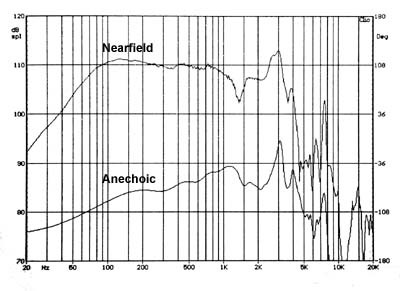 At this low frequencies the driver diaphragm acts like a rigid piston and the near-field measure is directly proportional to the far field one and is not affected by the environment in which the driver is. D = 2 * ( Sd / 3.14 )½ or measure the diameter with a ruler not considering the foam suspension. So in the Visaton case, D = 16.6cm so Fmax = 660 Hz that means that we can use the near-field response till this frequency. However this is valid for a driver mounted on infinite baffle, while lowers for a driver mounted on a panel, cause of the baffle effects, as reported by C. J. Struck & S. F. Temme. Just use the baffle dimension instead of the driver diameter, in the seen formulas. 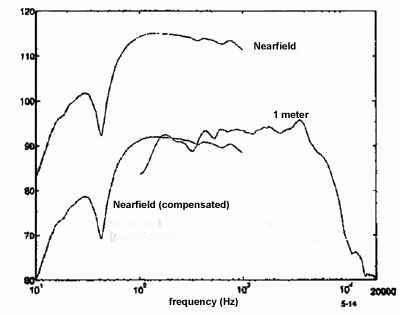 In our case, the baffle dimension is 22 cm therefore Fmax = 10950 / 22 = 498 Hz. The microphone has to be placed very close to the driver center, but not attached to it. 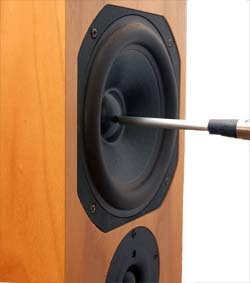 so the Visaton center cone will be as close to the mic as possible, <= 0.9 cm. Click here to read about Far - Field Measurement or Ground - Plane Measurements.